Two halves join together to function just like my standard phone wallet. But sometimes you want to travel light, and then you can take just your phone. When you need more space again, just snap the two halves back together. Construction time is 1-2 weeks. Free USPS Priority shipping to all US customers. All products come with a lifetime warranty. Full warranty description in the policies tab. We make everything here in the USA in our Portland, OR studio; hand-stitched and made-to-order. Our wallet case offers great protection to your phone from most normal wear and tear. One of our customers even dropped his phone wallet while working on a cooling tower. It fell from 35 feet onto gravel and both the phone and wallet were fine. 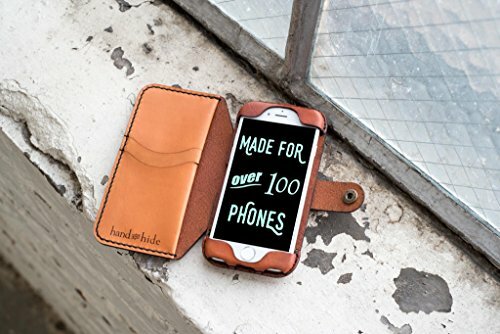 Our smartphone wallets feature premium full-grain cow leather that is hand-stitched. The leather is hand-dyed with eco-friendly water-based dye and sealed with beeswax. The base wallet has 2 standard card slots with a full length pocket for cards or folded cash underneath. It can have up to 4 optional additional card slots. See the last photo for color swatches. Actual product color may vary from what you see on your screen. See the policies tab for more information. The location for inscription is centered at the top of the card slots on the inside of the flap. The default font is Sorts Mill Goudy. Please include exactly what you want in the options menu. Choose any of the fonts shown in the last photo - you can also preview them at: www.google.com/fonts. IF YOU DON'T SPECIFY YOUR PREFERENCES, WE'LL USE OUR BEST JUDGEMENT. Buyers outside of the US, please be aware that you are responsible for any and all customs or import duties which may be significant. Color: Available in 8 colors: Dark Chocolate, Chestnut, Charcoal Black, Blue, Green, Red, Yellow, Violet. If you have any questions about this product by Hand and Hide, contact us by completing and submitting the form below. If you are looking for a specif part number, please include it with your message.